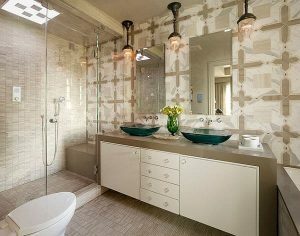 As the part of the house that sees more use than any other, the bathroom in your house deserves every bit of the design attention that it gets. Whatever you invest in it, you can be completely sure that you’ll get your money’s worth out of it. You should consider going high-tech with your next bathroom remodel. Tech in the bathroom isn’t just about imitating “The Jetsons”. These ideas actually have a higher purpose — like better hygiene or helping the environment. You’ve probably experienced hands-free bathroom fixtures at airports, offices and restaurants. For the home, though, these tend to come with a greater level of control. Kohler’s touchless flushes don’t activate the moment you get off the seat, for instance — they wait for you to wave a hand over a sensor to set it off. At under $100, these models are affordable, and can be retrofitted to most toilets. While touch-free flushes are excellent for hygiene, it doesn’t make sense to leave other fixtures the way they are. Noncontact faucets and soap dispensers are a healthy idea, too. Modern faucets are especially innovative — they offer contactless mixer controls. Touchless controls are more than simply hygienic and convenient; they also tend to be extremely useful to those who suffer from arthritis or other disabilities. Kohler’s $6,000 Numi toilet seat may be mind-blowingly expensive; it does have the tech to justify the price tag, though. It comes with a motion-activated heated lid and seat (no more worrying about leaving the toilet seat down), it washes you with an inbuilt bidet, dries your behind, and also provides some illumination for the bathroom. If you don’t want to spend as much on these features, a number of other brands offer them at a wide variety of price points. A few products even offer a better feature set. Brondell’s toilet seat, for instance, offers massages. There is a different kind of way to use technology in the building of a toilet. The Sun-Mar Compact Composting Toilet, for $1,500, actually turns human waste into compost rightwithin the toilet’s compact enclosure. Some models are actually completely water-free. The bathroom is where you get to study yourself closely; a mirror, then, is an important accessory. While outlets such as Bedbathandbeyond.com do offer beautiful, traditional mirrors, it makes sense to consider raising the stakes. Simplehuman Sensor Mirror comes with a novel idea — it features simulated daylight LEDs built into the edges of a mirror, and an automatic sensor that turns the system on when you are within range. With fitness products like Fitbit becoming more popular by the day, it makes sense to connect everything that you would use for fitness purposes to your fitness tracker. Fitbit’s Aria is a smart bathroom weighing machine that connects to your Fitbit band or app through Wi-Fi. Whether you like Water-Pik’s water-based approach or a more traditional electric toothbrush, getting high-tech with oral health makes a lot of sense. Products like Philips Sonicare are an investment that pays you back by actually preventing dental problems. Kristine Moody has tackled a number of bathroom makeovers as she manages a rental property portfolio. She likes to promote energy efficiency in her properties and enjoys sharing her insights online. Kristine also finds time to write regularly for a number of home and leisure websites.